We have been busy lately delivering custom industrial ovens, direct fired thermal oxidizers, but we’ve recently delivered several custom thermal deoilers based on our patented method of coupling heat processing systems and air pollution control systems to deliver these results. The Result: This system’s efficiency has significantly reduced cost by more than 30% when comparing the old method of aqueous cleaning to the thermal deoiling process. This deoiler also eliminated toxic waste water and reduced water consumption as well. The Result: This system’s efficiency has significantly reduced fuel consumption and operating cost by over 30%, as well as reduced the amount of water usage and eliminated the production of toxic waste water. Epcon Industrial Systems also delivered a thermal deoiler to a major HVAC equipment supplier. 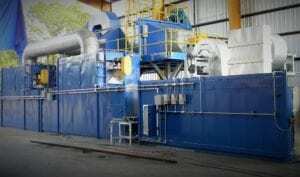 This integrated system consisted of a processing oven to clean the residual oil present in the HVAC coils, combined with an air pollution control system thermal oxidizer to destroy the solvents evaporated during thermal cleaning process. This processing oven features a dual lane conveyor system with a precision lane adjustment mechanism, and unique air distribution nozzles arrangement to offer high and low-pressure air impingement over specific areas of the HVAC coil. The combination of a higher recirculation rate and turbulence in the Oven processing chamber allowed the end user to achieve proper cleaning of parts in 20% less time. Need More Information About Thermal Deoiler Systems?